Being a bird owner is certainly a labor of love! Enjoy a rewarding bird owning experience with AquA AnimaniA selection of bird supplies. Whether you own a parrot, macaw, cockatiel or parakeet, AquA AnimaniA is your headquarters for bird cages, bird play gyms, bird treats and much more. Keep your bird happy and active with one of AquA AnimaniA’s bird perches, bird swings, bird ladders or bird toys. Keep your bird healthy with AquA AnimaniA’s featured bird health supplies, bird grooming supplies, bird supplements and nutritious bird food. 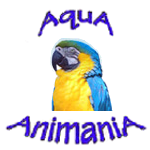 Take advantage of AquA AnimaniA’s great prices on bird supplies today!